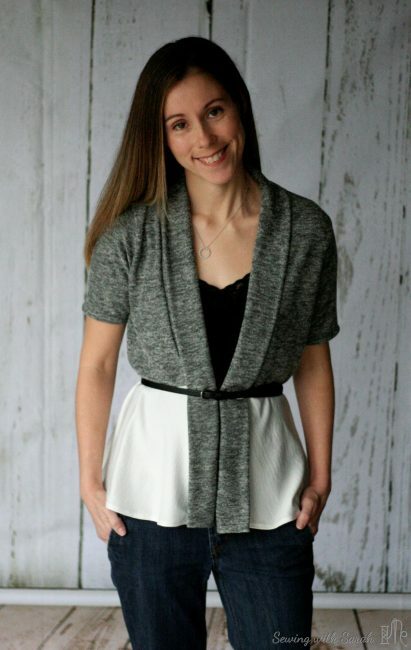 I’m back with another pattern test- this time for a women’s peplum cardigan: the Ficus from Sew Like My Mom. I know what you’re thinking: peplums? Are those still in? Won’t they accentuate my, um, assets? Well, I’m no fashion icon (I hate real pants, remember?) 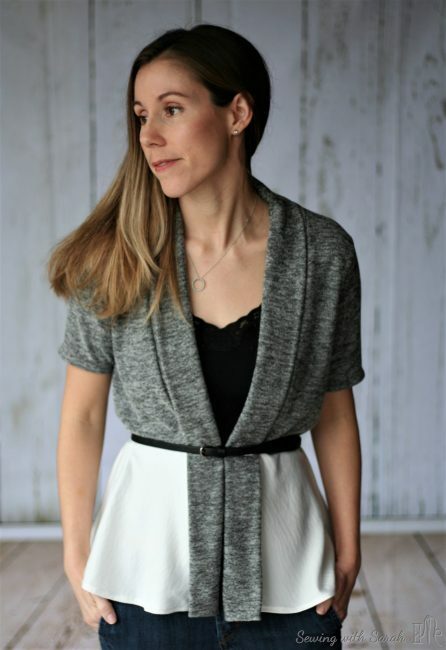 but this cardy is both stylish and comfortable, and flatters a variety of body types (see all the tester versions!). There’s even a matching kids version for your mini-me (I haven’t made that yet, but I will soon, because I’ll get away with the matchy-matchy stuff for as long as humanly possible with my only girl child). The Ficus comes with options for elbow, short or long sleeves, and is designed for knit fabrics. I made the short sleeve version, because its perfect for the Spring I keep hoping is just around the corner. Of course, while I was trying to channel spring, it was pouring rain, gusting wind and NorCal was flooding. So the pictures had to be moved inside to my garage-turned-photo-studio (Bonus: moving the car out of the garage into the rain counts as a car wash). Of course, you know by now I just had to see if I could sew outside the box again, and so I hacked it for a woven peplum. I’ve seen so many tops with woven/chiffon bottoms in the stores, so I wanted to see if I could re-create that look. I used some hacci sweater knit from LoveAdore for the bodice and collar, and paired it with a white rayon challis from my stash. I was worried about whether or not I could ease the woven into the knit, but because the peplum inner circle ends up being on the bias, it worked out beautifully (bias stretches). Want to make your own woven peplum Ficus hack? Its pretty simple, and I love the result. You’ll need to take a few things into consideration when using a woven instead of a knit. 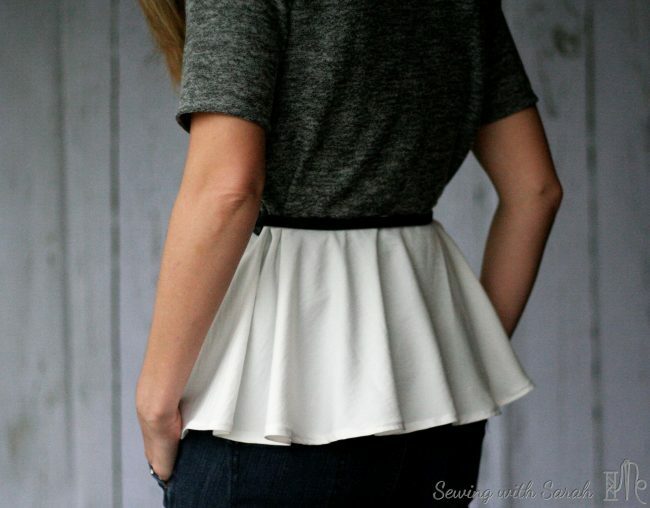 The first is not to handle the peplum part too much after cutting, because things cut on the bias tend to stretch out easily. You may even want to stay-stitch it for good measure. The other thing to consider is how you will finish the edges of the peplum- because you’re using a woven instead of a knit, you’ll need to finish them somehow so they don’t fray. I followed this tutorial from Oliver and S, using Ban Rol to hem- easy peasy. This was a new technique for me (I love how pattern testing encourages me to try new things) and it worked out beautifully. That’s it! 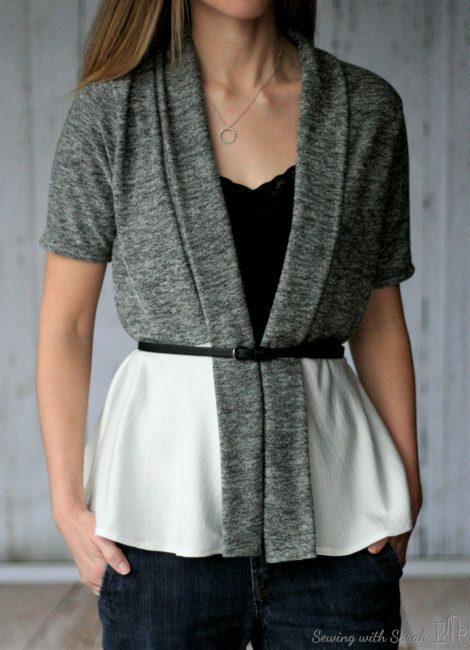 You’ve got a cute peplum cardigan that will see you through spring and summer. So go check out the Ficus- its a great excuse to use (or buy!) some new knit fabrics! I’m an enabler, I know. You’re welcome.